The final beer for the Queen's Celebratory year touches on the exotic! The expression 'Time Flies' takes on a particular meaning in the case of the Windsor & Eton Brewery as incredibly, it was over two years ago that Paddy Johnson invited me to view their new 'state of the art' brewery' - and much has happened since! I recall my conversation with Paddy at the time, a mixture of optimism and enthusiasm, tempered, not unnaturally (with the recession looming) a touch of apprehension. Starting up any brewery can be a daunting experience, but the one card the team could play better than most was the combined experience they had to offer. This would prove invaluable, and thankfully they have gone from strength to strength. With three draught beers quickly established, I also remember Paddy at the time offering me the opportunity to sample a 'bottle conditioned' and 'filtered' version of what was to be their first bottled offering - Conqueror, and asking for my verdict. Windsor & Eton were to move into the bottled ale arena quicker than most, and Knight of the Garter and Guardsman soon followed. With the breweries location the military theme seemed a logical choice, but the up and coming Royal Jubilee Celebrations would give them a chance to flex their muscles in more uncharted waters with the opportunity to experiment with new brands. Uniquely they would base their approach on events 60 years ago, with three brands capturing defining moments in the then, new queen's life, and released at intervals during the celebratory year. The choice of raw materials used in each of the beers would reflect the places she visited, summing up the flavours (literally) of the exotic locations. 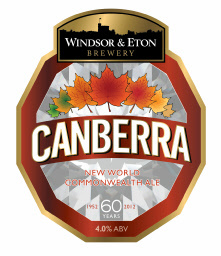 All of the beers would go under the banner of 'Commonwealth Ales'. 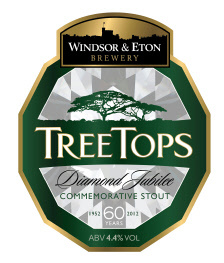 The first of these Tree Tops, an Africa Export Stout, would use coffee and vanilla in its blend. The second, Kohimoor an Indies Pale Ale, jasmine, cardamom and coriander likewise. The third and final release in the trio is Canberra, which uses an intriguing array of ingredients in its blend. The name is taken from the fact that on the day of the Coronation itself a film of the event was taken by Canberra jet bomber and flown to Australia, allowing the film to be seen on the same day, but at the other end of the globe! Chocolate and Crystal malts give the beer not just its Chestnut Autumnal hue, but a suggestion of warmth for the coming months ahead. But, in contrast to expectations, it is the choice of hops (Nelson Sauvign, Motueka and Galaxy) which gives it that truly Antipodean feel, plus one final ingredient from the other end of the Commonwealth - Maple Syrup from Canada. The result is an aroma of light summer zestful fruits, with a firm bodied rounded palate. There is a delicate mix of marmalade and orange peel flavours nicely interwoven, and a lingering peppery follow through on the tongue at the finish. Given that the beer is only 4%Alc/vol. the beer manages to hold good flavour. Judicious use of the Maple Syrup (always a must to prevent it becoming cloying or overpowering) is well handled here, and the beer would sit happily alongside such classics as Tommyknocker's Maple Nut Brown of Colorado, which uses the syrup equally sublimely. Windsor & Eton have once again pushed the barriers in terms of originality on the British craft brewing scene, and leave us in excited anticipation as to what will come next. Whatever it may be it will be done with the same level of dedication and commitment as to what has gone before. On this mission, Canberra did indeed hit the target!